There’s more than one way to run a mission-driven business. Benefit corporations are allowed in 30 states and the District of Columbia. Two of those states (Maryland and Oregon) also allow benefit limited liability corporations (BLLCs). Social purpose corporations (SPCs) are legal in four states; low-profit limited liability companies (L3Cs) are legal in eight. More forms are in use outside the United States. And we’re not even talking about Certified B Corps. Sorting this out is the mission of Social Enterprise Law Tracker, a new project from two members of New York University’s Law and Social Enterprise Fellowship program. “People are approaching the task of running social enterprises in different ways. Several different forms are available in the US, and other countries have even more,” says Rob Esposito, an attorney at Drinker Biddle Reath who launched the site with Shawn Pelsinger in May 2015. It’s like IPhone vs. Android, VHS vs. Betamax, or alternating vs. direct current. Social enterprise laws are new. Vermont passed the first L3C law in 2008, and Maryland was the first to allow benefit corporations in 2010. Whenever a big idea emerges, it’s common for several variations on the theme to compete before the market chooses a standard format. Until that happens, there’s a lot of confusion. 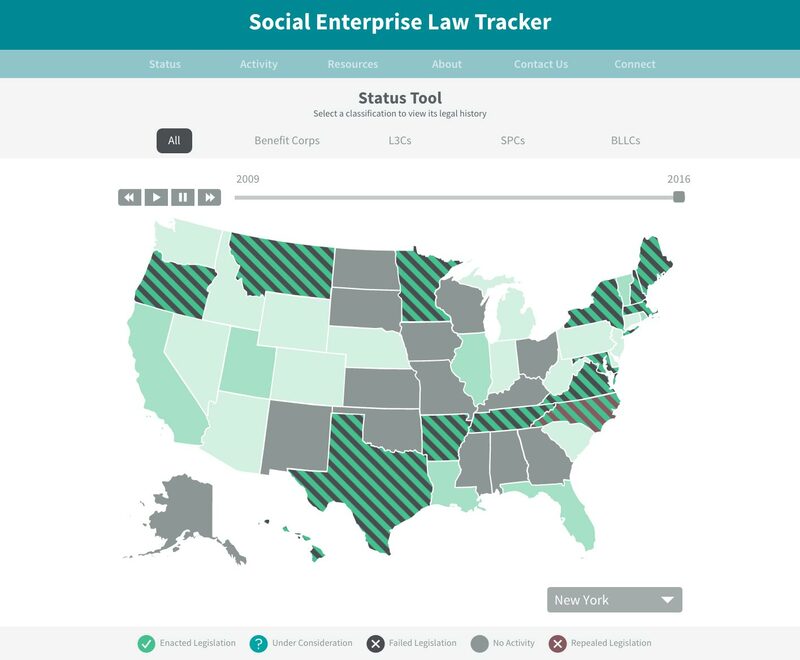 The site features an ingenious interactive map (above) that shows how states have passed, considered, failed, and repealed social enterprise laws each year from 2009 to 2016. It has separate maps for benefit corporations, L3Cs, SPCs, and BLLCs, and each map connects to spreadsheets containing detailed information and links for each law. The site also includes links to resources in the field, and it’s free. Benefit corporations are the most common legal form for social enterprise, but the debate is far from over. The states of Washington and Texas allow SPCs but do not allow benefit corporations. Georgia and Ohio allow neither, but their lawmakers are considering both. Wisconsin’s legislature is currently considering a L3C law. But North Carolina has repealed their L3C law, and this legislation has failed in 18 other states. The next step for the site is mapping social enterprise law in other parts of the world. “By doing the US, we’ve finished about half the work,” says Pelsinger. “But there is a tremendous amount of activity in Europe.” You can see hints of what’s going on in Greece, France, the UK, Spain, and other countries at the site of The European Social Enterprise Law Association (ESELA), which was founded by the European Commission three years ago. But SocEntLawTracker.org is easy to understand, and the ESELA site is not. Esposito and Pelsinger have built and maintained the site with support from NYU’s Law School, using their own network of contacts to keep up with what’s going on in social enterprise law. They are eager to expand the network by accumulating tips and leads from interested visitors—so check it out. Sign up for our free newsletter and you won't miss a single B-Corp Report! BenefitCorpReporter offers an independent perspective on benefit corporations and the movement to turn business into a force for good. We’re hopeful but skeptical. More. The site is a project of award-winning journalist Brad Edmondson. Contact.